Red beans and rice is the quintessential Louisianan comfort food. Nothing satisfies like steaming bowl of tender flavorful beans over classic white rice. In a large stockpot or Dutch oven, warm the oil until a few droplets of water sizzle when carefully sprinkled in the pot. Add the onion, bell pepper, celery, and garlic and cook until the vegetables are soft, about 5 minutes. Stir in the parsley, oregano, thyme, and bay leaves. Season with salt and pepper to taste. Add the ham hock and sausage and cook, stirring, to brown the ham hocks and sausage, about 4 minutes. Add the beans and water. Over high heat, bring the mixture to a boil. Reduce the heat to medium-low, cover, and simmer, stirring occasionally, until the beans are tender, about 1 1/2 hours. Add additional water while cooking if necessary. Remove the ham hock from the pot and pull the meat from the bones. Roughly chop the meat and return it back to the pot of beans. Adjust seasonings as needed. Discard the bay leaves. Spoon over white rice to serve. Cooking Tip: Add Tabasco® or your favorite hot sauce for a little heat. Do-Ahead: Cooked red beans store very well in the refrigerator. Some even say they taste better the second day! This is my husband’s favorite dish. Not only is it delicious, but it brings memories we both love to savor. Paul spent a semester in college studying in Venice. It was a time I think he will cherish forever. When we were dating, we decided to take a trip to Europe to show each other our “homes” abroad … for me, Paris and for Paul, Venice. It was in Venice, that Paul got down on one knee and made me the happiest girl in the world. 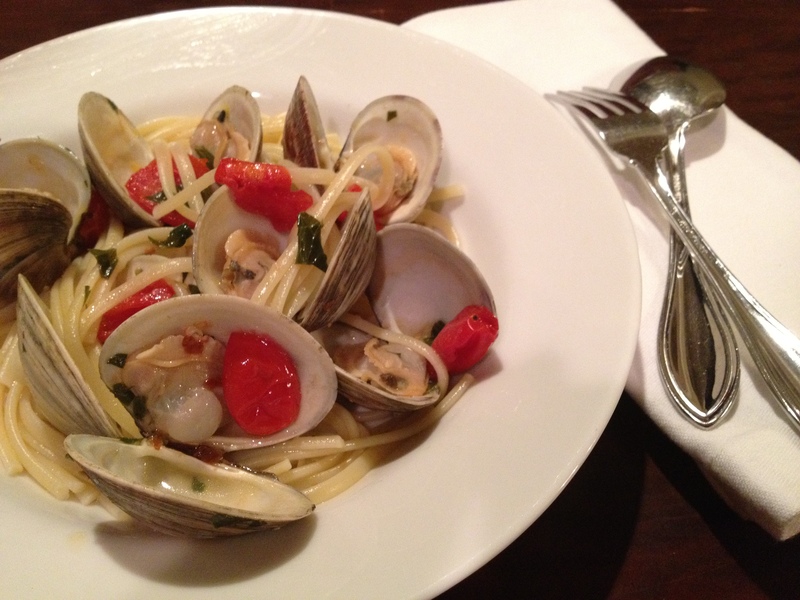 That evening, I enjoyed my first true Spaghetti Vongole with a bottle of Pinot Grigio as we celebrated our engagement. This is the dish I will making for my Valentine this year. It is full of love, flavor and … as an added bonus is surprisingly simple to make. Sort through your cleaned clams to make sure all are tightly closed. If any aren’t closed, that means they are dead so throw them away. In a large pot over medium-high heat, warm the olive oil until a few droplets of water sizzle when carefully sprinkled in the pan. Add the garlic, red pepper flakes, and the tomatoes. Stir and cook until the garlic turns fragrant; be careful to not let it brown. Add the white wine and stir to combine. Add the clams, stir gently, and close the lid. Cook for 4 to 5 minutes, or until the mussels open. Add the drained pasta to the pot along with the parsley. Toss to combine. Season with salt and pepper to taste. Serve immediately. When buying fresh clams, do not seal the plastic bag. The clams are still alive and need to breathe. I immediately transfer them to a colander to store in my refrigerator until ready to use. To prepare the clams, first discard any with broken shells or that are open. Rinse under cold water to remove any dirt. 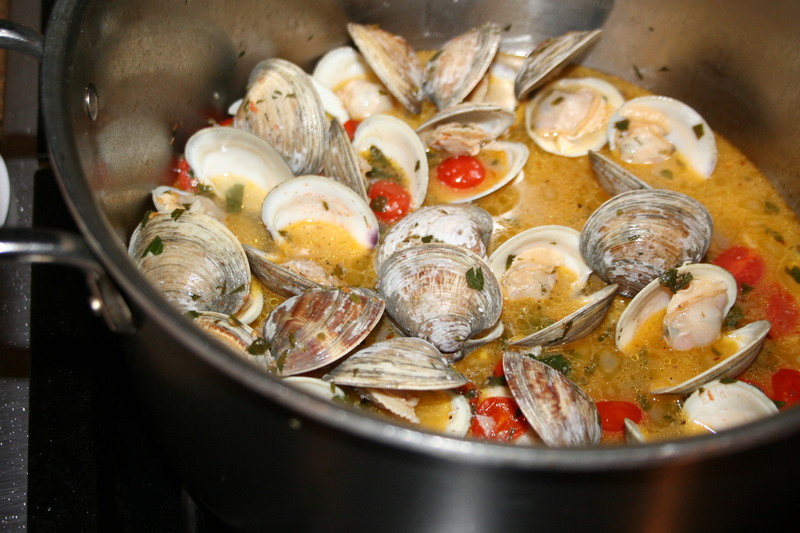 Any clams that do not open during cooking, should be discarded and not eaten. “Jambalaya and a crawfish pie and filé gumbo…son of a gun, we’ll have big fun on the bayou.” So goes the refrain of the famous song “Jambalaya” by Hank Williams Sr.
Leave it to the folks in Louisiana to make a catchy tune about food their anthem. No where else in the country is food such an integral part of the culture. One only has to mention the city New Orleans and good times and great food come to mind. South Louisianans have a love and a passion for good food. Their cuisine is unique because, as a whole, it has a much bigger flavor than what you get in the rest of the United States. For those not born and raised in Louisiana, what we consider “Cajun” food for the most part is technically “Creole” cooking. The French who settled in Southern Louisiana in the early 1700s adapted their own outstanding culinary techniques to the abundant herbs, seafood, games, meat, vegetables and fruits of the region. Eventually their cooking style was infused with spiciness from the Spanish settlers and African slaves’ use of herbs. This mélange of styles became known as Creole cookery. Native Louisianans differentiate between Creole cooking and Cajun cooking based on the use of rouxs and spices. Creole cooking is based on French techniques with less emphasis on roux than Cajun cooking. The herbs of choice are oregano, basil, thyme and bay leaf. Also, almost every dish has celery, parsley, onions and bell peppers in its list of ingredients. Cajun cooking on the other hand is heavily dependant on the use of rouxs. It uses the same herbs and vegetables as Creole cooking but often adds the spice of cayenne or Tabasco. Creole cooking is most attributed to New Orleans whereas Cajun food is most identified with towns such as Lafayette and Ville Platte in Southwest Louisiana. 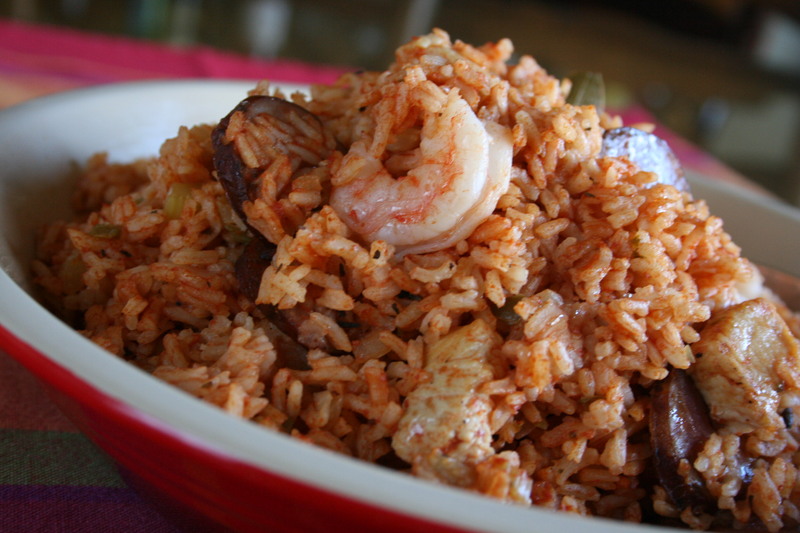 The Creole version of “dirty rice,” jambalaya is best enjoyed simply with a loaf of crusty French bread. My recipe include shrimp, chicken, and sausage…but you can omit easily omit the shrimp if someone at your table has an allergy. Season the chicken with salt and pepper. In a large stockpot or Dutch oven over medium–high heat, warm the oil until a few droplets of water sizzle in the pot. Sauté the chicken, stirring occasionally, until nicely browned, about 5 minutes. Transfer the chicken to a plate and then, in the same pot, sauté the sausage until browned. Transfer the sausage to the plate with the chicken. Drain all but about 1 tablespoon of fat from the pot. To the pot, add the onion, bell pepper, and celery and sauté until soft, about 10 minutes. (Stir often so that everything cooks evenly.) Add the garlic, oregano, thyme, and bay leaves and sauté until the mixture is cooked down, about 5 minutes more. Season to taste with salt and pepper. While the vegetable mixture is cooking, combine the tomato sauce and chicken stock in a separate pot and bring to a simmer. Add the rice to the vegetable mixture and sauté for about 3 minutes. Return the meats to the pot and stir to combine. Continuously stirring to combine, slowly pour the tomato and stock mixture into the jambalaya. Stir in the chopped parsley. Bring the jambalaya to a boil, cover, and simmer over medium heat for 30 minutes, or until the rice is tender and most of the liquid has been absorbed. Turn off the heat and fold in the shrimp. Let everything continue to cook in the hot covered pot for an additional 10 minutes. Serve warm. Cooking Tip: Andouille sausage is a smoked, spicy pork sausage that is popular in Cajun recipes such as gumbo and jambalaya. If you can’t easily find it in you local grocery, Chorizo is an acceptable substitute. Happy New Year! Don’t know about you…but I am so excited about 2010. It’s going to be a big year for me with a new book, some exciting new food adventures on the horizon … and this new blog! As with all my cooking…my recipes are about getting good food on the table simply. My posts will offer quick, easy and delicious ideas for your next meal. I’ll also occasionally share some fabulous food finds and dining adventures. For my first blog entry, I’d love to share with you a recipe for these chilly January nights…my homemade and ultimately delicious Mac-n-Cheese with a Twist. Unlike the orangey-yellow boxed variety that many of us grew up on, homemade Mac-n-Cheese is a ooey, gooey, creamy delight for both the kids and grown-ups at the table. It’s a sinfully good indulgence that I just can’t pass up. I like to use two cheeses in mine. 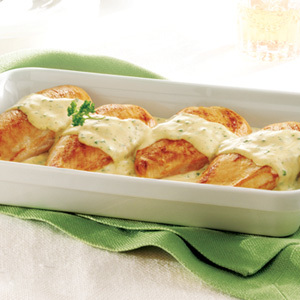 First, a sharp, tangy white cheddar that adds a delicious bite to the sauce. Next, I throw in some Gruyère which adds a sweet nuttiness. Then to truly make this pasta dish stand out, I add country ham, fresh herbs and crunchy topping made from crusty artisan bread. Pre-heat the oven to 375°F. Butter a large casserole dish and set aside. Bring a large pot of salted water to a boil. Cook the macaroni until it is just tender, about 4 to 6 minutes. Drain, rinse under cold water, and drain again. Set aside. In a small saucepan, bring the milk just to a boil, remove from the heat, and set aside. Melt 3 tablespoons of butter in a medium saucepan over medium-low heat. When the butter foams, add the flour. Cook, whisking, for one minute. While continuing to whisk, gradually add the milk. Continue cooking, whisking constantly, until the mixture thickens, about 5 to 8 minutes. Do not brown. Remove the pan from the heat. Stir in the nutmeg, 2 cups cheddar cheese and ½ cup Gruyère cheese. Season to taste with salt and pepper. Pour the macaroni into the cheese sauce and stir until well coated. Add the diced ham, thyme, and parsley and stir until well combined. Place the mixture in the casserole dish. Melt the remaining 1 tablespoon butter. In a small bowl combine the bread crumbs, remaining cheeses, and the melted butter. Evenly spread the bread crumb mixture over the top. Bake until golden brown, about 40 minutes. Serve warm. Back to the Basics: Prefer just plain old mac-n-cheese? No problem. Just omit the herbs and country ham. Food Fact: I just love the nutty flavor of a Gruyère. Great for melting, this firm cow’s milk cheese hails from Switzerland and is now found in most grocery stores. 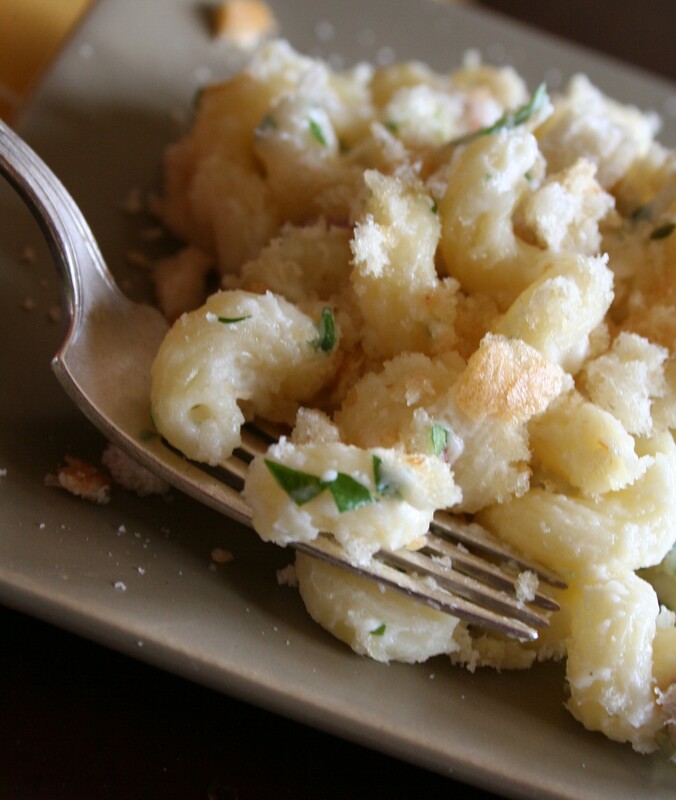 Freshly grated Parmesan or Pecorino Romano cheeses are acceptable substitutes. In a small bowl stir together gremolata ingredients and season to taste. Set aside at room temperature. Season the steak with salt and pepper. Grill over medium-high heat until medium-rare, about 5 to 6 minutes per side. Remove the steak from the heat and set aside to rest for 5 to 10 minutes. Garnish with gremolata.